Most of the articles you will read about boxers are about the money fighters, the stars, the ballyhooed prospects, the anointed ones. These boxers are the ones who make the sport go round. They bring hype and considerable media attention, to say nothing of seven-figure signing bonuses and the backing of the sport's promotional machinery. But this isn't one of those articles. This piece highlights the gate crashers, two fighters who weren't supposed to garner attention. But it's not a sob story about the plight of the journeyman or the thanklessness of the cruelest sport. 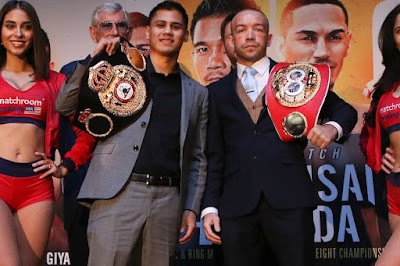 No, this is about Daniel Roman (26-2-1, 10 KOs) and TJ Doheny (21-0, 15 KOs), two unlikely junior featherweight titleholders who fight for one of the big prizes in boxing on April 26th, a unified championship. And although they are relatively unknowns in the sport, make no mistake: they are both damn good fighters. Where to begin? Let's describe unlikely rises to the top. As a young fighter Daniel Roman signs with Thompson Boxing, as good as a regional promoter (Southern California) as you will find in American boxing. However, after a pedestrian start to his career, Roman gets released from his contract with Thompson. What makes this story strange is what happens next. Roman rededicates himself to boxing and through hard work in the gym and in the ring he convinces Thompson to re-sign him. A key point in Roman's career was a ShoBox date in January of 2017 where he faced undefeated prospect Adam Lopez. For Roman, this was the biggest opportunity of his career. Finally, he was receiving national exposure after more than six years as a professional boxer (there's something to be said for Roman's persistence, which is a recurring theme of his, both in and out of the ring). And even though Roman was not known for his power, he knocked down Lopez twice and forced a corner stoppage after the ninth round. But Roman was just getting started. In his next fight he travels to Japan for a junior featherweight title opportunity against undefeated Shun Kubo. Roman dominates every second of the fight and earns a ninth-round stoppage. Then, the American tempts fate by traveling back to Japan for his first title defense against Ryo Matsumoto in Tokyo's fabled Korakuen Hall, one of the most famous boxing arenas in the world. It's no secret that it can be tough for a foreign opponent to win a decision in Japan, but Roman defeats Matsumoto with ease, winning at least ten rounds on each card. Returning to America, Roman now starts to generate a little buzz. And after another comprehensive victory over Moises Flores, Roman signs a co-promotional agreement with Eddie Hearn to fight on DAZN. His first fight under the new arrangement is viewed by many as a difficult assignment, Gavin McDonnell, an English fighter (and brother of former champion Jamie) with a great motor and a sturdy chin. McDonnell puts forth a spirited effort, but in the end Roman makes mincemeat of him, bloodying and bullying him over 10 rounds to get the stoppage. Doheny's story may be even more obscure. Originally from Ireland, Doheny failed to make the Irish Olympic team for the 2012 games. After that setback he decided to move to Australia because of the country's bustling economy. He eventually turns pro at the age of 25 (how many 25-year-old debutants become world champions in the smaller weights?). In his 12th pro fight he's still fighting an opponent with a 1-8-1 record. He's not making much headway. He's this close to quitting the sport for good. Frustrated with the direction of his career, he moves half way around the world again to train in Boston under the watchful eye of Hector Bermudez. But almost 30, he's still fighting eight-rounders. One day the phone rings and he has an opportunity to fight in Thailand for an eliminator. He escapes with a split decision and within a year he's off to Japan for his own title shot. And like Daniel Roman before him, Doheny was able to win a decision in Japan, a grueling fight against Ryosuke Iwasa. Doheny was a nobody in boxing. Too old to ever be a prospect, with few notable opponents to attract attention on his way up, Doheny, nevertheless, through a desire to improve and a willingness to make unconventional choices, was now a champion. And in his 30s the spoils suddenly started to roll in. He signed with the well-funded MTK Global for his management. In addition, he also aligned with Matchroom Boxing and Hearn. Roman-Doheny not only provides a rare unification bout in the sport, but the possibility of a wonderfully entertaining brawl. Yes, Roman is a come-forward boxer, but it would be inaccurate to describe him as a face-first pressure fighter. Roman exhibits a lot of craft in the trenches. And unlike garden-variety brawlers, Roman features a full arsenal of punches. He digs to the body with both hands. He has a fantastic right uppercut. A very good combination puncher, he'll crush the body and then startle opponents with a deceptively quick and accurate right hand to the head. On defense, he doesn't get hit as much as you would think. He uses his gloves and subtle upper body movement to evade a lot of incoming fire. Not fast or a superlative athlete, Roman though is quick. With good footwork and a strong understanding of what he needs to do to succeed, he gets to the spots in the ring where he can be most effective. Doheny is an unusual fighter stylistically in that he has much faster hands than feet. He doesn't move around the ring much, but he gets out of the pocket with subtle turns and spins. A southpaw, Doheny's best combination is the right hook/straight left hand. His jab is not a factor at all, but he can make opponents think twice about coming forward with lead left uppercuts. With sharp power punches, Doheny can hurt opponents from distance, mid-range and in the trenches. Roman-Doheny has the makings for a great action bout, as long as cuts don't hinder the fight. Doheny has gotten cut and marked up often in his career and Roman likes to come inside often, and from different angles. Doheny should have the advantage from the outside, but that will only manifest if he keeps a high work rate. And without a jab, there will be gaps for Roman to come inside. Very few fighters are equipped to handle Roman's combination of work rate, pressure and accuracy, but Doheny's left uppercut and right hook could be significant weapons against Roman in the trenches. Roman-Doheny is the co-feature to the mouth-watering rematch between Srisaket Sor Rungvisai and Juan Estrada. In part due to the strength of this card, no other boxing network or platform will be counter-programming it (a seemingly rare event in the busy boxing calendar – not that I'm complaining). For one night, Roman and Doheny will have the eyes of the boxing world on them, a moment to shine. The winner will become one of the few unified champs in the sport, joining the likes of bold print names such as Vasiliy Lomachenko, Canelo Alvarez and Anthony Joshua. And while it's unlikely that Roman or Doheny join those fighters as major never draws in the sport, remember that "unlikely" might be their calling cards. I don't like a lot of aphorisms associated with boxing, but one that has always resonated with me is "that's why they fight the fights." Neither Roman nor Doheny was supposed to arrive at this juncture in professional boxing. There were greater talents out there, bigger names, more impressive resumes, better promoted fighters, yet here they are, two unassuming boxers who believed in themselves when few did and made the most of their opportunities. And while Roman and Doheny are late to the party, they have fought and toiled to get past that velvet rope, the place where the beautiful people congregate. And they're not about to leave.